Susie's Law is a 2010 North Carolina state law which authorizes up to ten months in jail for convicted perpretrators of cruelty to animals. 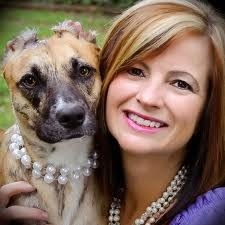 The law is named for "Susie", a part pit bull, which as a puppy was rescued in August 2009 from Greenfield Park in Greensboro, North Carolina having been set on fire, in torment and left to die. The law reclassifies the "malicious abuse, torture, or killing" of an animal from a Class 1 to a Class H felony, with the ten-month potential period of confinement. Susie had severe second and third-degree burns over most of her body; her ears were burned off, and she had a broken jaw and teeth. Susie's Law was passed unanimously in the North Carolina State Senate and took effect on December 1, 2010. Passage was possible through intense citizen involvement when Susie's abuse became public, and fund-raising appeals met with great success. Susie was rescued by Donna Smith Lawrence, who had been seriously injured in an attack by a pit bull, which she had befriended, several months prior to finding Susie. Donna and her husband, Roy, then adopted Susie. 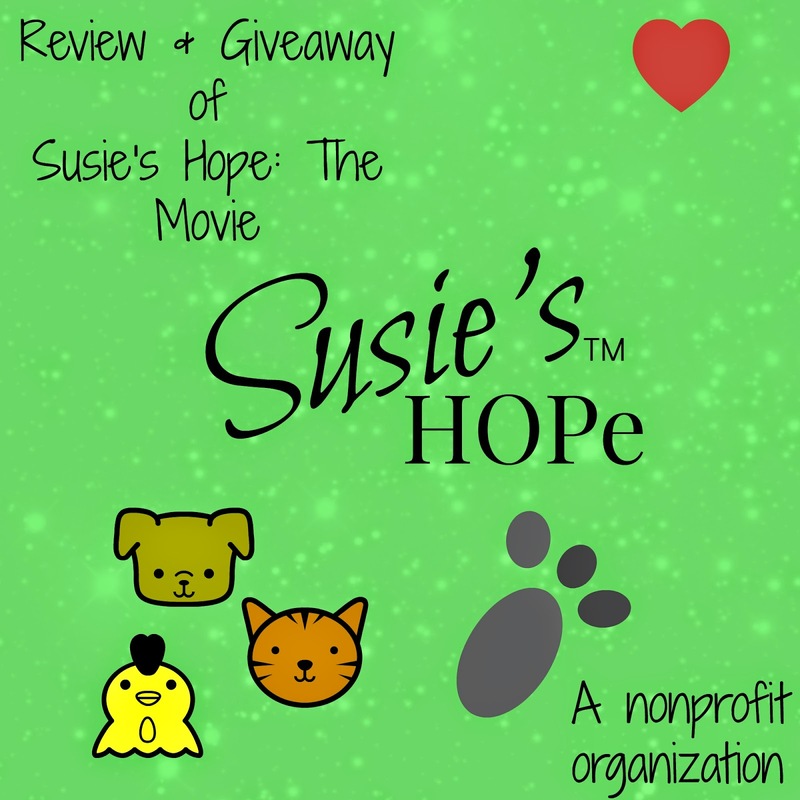 *It is the mission of Susie’s Hope™, a nonprofit organization, to foster awareness of the animal abuse that exists in our nation and to work to end this epidemic by providing education to people of all ages. * This is the beginning part of their Mission Statement as seen on their website. You can buy this heartwarming movie by clicking HERE. 15% of sales will go to Susie's Hope Foundation. There are also several books and an adorable stuffed animal that can be purchased. I was sent a copy of this heartwarming, I can not say it enough, movie. As a animal mom myself, I felt heartbroken that such a sweet animal was put through hell. It broke my heart but then lifted it as I watched her mom bring out the best! Not only that, but to bring out the best in others. And for justice for animals who can not speak for themselves. This movie would make a perfect gift for the animal parent in your life, or even yourself! 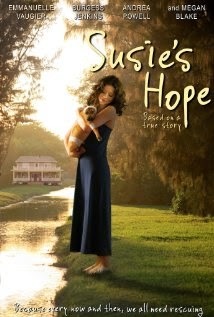 One of the best parts is I am holding a giveaway for one reader to win a copy of Susie's Hope. Use the entry below to enter and Good Luck! This pictures shows what I was sent to facilitate my review. I am an animal mom of two rescue dogs from the Rapid City Shelter. Our Children's names our Dutch (12) and Louie (6). I was a single animal mom who married a single animal dad. We have had a combined family now for almost 5 years. Dutch and Louie are brothers of every kind. One weighs about 30 ibs and the other 90 ilbs but the little runs the show. Including us. They are our only children and we love them unconditionally.. I have a 6 year old Jack Russell Terrier. I rescued her 2 years ago and it was the best decision of my life. She is my best friend. I'm an animal mom of two kitties I adopted from craigslist. Peeper is an FIV positive black kitty that we got as a kitten and Rusty is a maine coone mix that we also got as a kitten. I love my kitties ..I love taking pictures of them and posting it up on Instagram. Our animal baby is a beagle mix that gives us love and happiness each and every day. We spoil him but he is so warm and forgiving when we make mistakes or are short-tempered...he earns every kibble! I have 1 dog, 2 cats, and 4 fish. Got them all at different ages. I have had my dog since she was a pup for ten years. We are best friends. All of my animals are rescue pets. I am a new dog mom. I adopted her from the local animal shelter about 10 months ago. I'm her 4th home in 4 years but she found her forever home with me. It has been challenging but she's my little love bug. I am an animal mom. I got my cats from our local flea market from families who had to move and could not have pets. We got them from babies. I'm an animal Mom. We rescued our Dog from a neighbor who moved out of their home and left the dog behind. Where to begin! I have adopted 2 cats and one dog. I have rescued 3 cats and 1 guinea pig! <3 my most recent addition is a 6 yr old calico cat that is 19.2 lbs of pure love! We are working to get her back to a healthy weight and she is doing so well! We have 2 dogs (King Charles Cavalier & a Great Dane/Mastiff) and 1 cat. My daughter LOVES animals. She would love this movie! Thanks for the chance to win. I am an animal mom. Vinnie was a rescue when he was a few months old, and suffering from Parvo. Rosie I bought from a local breeder. I met her at 6 days old...she chewed on my finger and I just fell in love! Her mommy wasn't so sure about me by her babies, but her dad was just so goofy and full of himself, I put my deposit down on her and picked her up when she was 6 weeks old, and she really has had my heart since then... Love my Pugs!!! We have two cats- we adopted both as kittens.